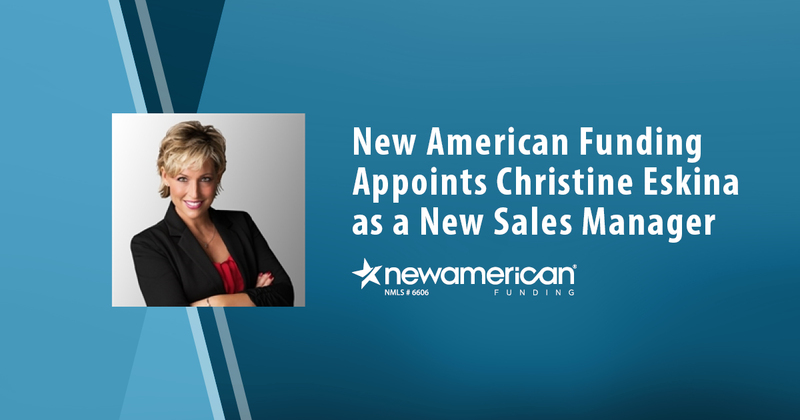 New American Funding, a leader in the mortgage industry, has named Christine Eskina as Sales Manager covering its Southern California territory throughout the Inland Empire, San Bernardino Mountains, Greater Los Angeles, Orange County and San Diego. Eskina will focus on expanding the company’s footprint across this region through originating loans and building a team of originators. Eskina, who is joined at New American Funding by her valuable team, brings 25 years of mortgage experience to the company that ranges from processing to underwriting; most recently, she was a Branch Manager and Senior Loan Officer with an independent lender, where she was a top ranked originator within the company for three consecutive years. Eskina specializes in working with a cross-section of clients and brings a well-rounded perspective to her borrowers as a result of additional insight she has gained through buying and managing rental homes, and working with investors to flip properties. She’ll be based in Temecula, where she’s been a long-time resident of the region.